A superb take on Fender's finest with hot-rod trickery from one of the world's top players. PRS's finest ever bolt-on electric? We think so. Near flawless build quality. Excellent tones. Superb comfort and playability. Brent Mason, known as one of the most recorded guitarists in history, is the latest addition to PRS's 20-strong signature roster. His career kicked off in Nashville back in the early 80s when Chet Atkins heard about him and brought none other than George Benson to see him play. It led to recording with Atkins on Stay Tuned, among many more famous players like Mark Knopfler, Benson and Earl Klugh. His session career started with Randy Travis in 1987 and over the following decades he played on countless records, TV and film soundtracks, not to mention his own projects like 1997's Hot Wired, which became the benchmark for his hot Tele country/western swing style. There have been numerous awards along the way, not least a Grammy, a Valley Arts signature guitar (based on his modded '68 Fender Telecaster), a Wampler signature pedal and, released in 2013, this new PRS. Based on the 641mm (25.25-inch)-scale DC-3 and more specifically the NF-3, both of which have kept a pretty low profile in the UK since their launch in late 2011, its Fender flavour is more than obvious. Like the NF-3, it sports a flat-front Korina body with a nicely curved forearm contour and substantial belly cut. "The hallmark PRS scoop on the treble cutaway and rounded heel make top fret access more than comfortable"
The quarter-sawn pattern-profile maple neck bolts on in traditional fashion, while the hallmark PRS scoop on the treble cutaway and rounded heel make top fret access more than comfortable. Mason's clearly a bird lover as, unlike the DC-3/NF-3, there are no ring dot inlay options, although a rosewood fingerboard with 'alt-ivory' birds is available. If the birds don't give the game away, there's the equally identifiable three-a-side headstock - the neck's clear un-tinted finish (a hand-applied UV 'sealer') does look a little bland but it's extremely thin, and our playing sample is already showing signs of becoming dirty looking on the fingerboard face. Fretting is typically superb, not to mention the usual PRS hardware - open-back Phase III tuners, vibrato (with steel, as opposed to brass, saddles and knife-edge mounting screws), the lampshade knobs and an overall feel of effortless purpose. These larger-footprint humbuckers first appeared on the 408, released in late 2012. On 2013's Paul's Guitar, the narrower neck humbucker was retained, and as here, that same smaller bobbin was used for the bridge humbucker, too (the 408's bridge humbucker is bigger). Mason needed a slightly hotter wind, which is actually what is now fitted on Paul's Guitar, too. These humbuckers are augmented by a 305 single coil, and oddly, that middle pickup screws directly to the body; the two humbuckers, knobs and switches are scratchplate-mounted while the jack socket, sited on a metal plate, sits on the guitar's side. The two mini switches activate a dual/single- coil function, and as we heard on Paul's Guitar, there's virtually zero volume drop between the two settings, just a little more hum in single- coil mode. The five-way switch selects the usual Strat-like pickup combinations. With nearly 30 years of guitar building under its belt, PRS doesn't put out a bad instrument and from the generous acoustic resonance here through the multitude of plugged-in tones, it's a hard guitar to put down. "If we're honest, we prefer the strapped-on feel to a standard PRS; it feels Fender-familiar"
If we're honest, we prefer the strapped-on feel to a standard PRS; it feels Fender-familiar, and if you find your Strat or Tele lacking, here's a possible replacement. There's a slight relaxation in string tension: the pattern-profile neck feels chunky, but not like some 1950s relic. It's just so easy to play, with intonation, set-up, and vibrato stability all spot on. Having used our trusty Strat to warm up the tubes, it's like you've just changed cars from an Austin Marina to an Aston Martin. In single-coil mode (which voices the forward-facing slug coils of both 'buckers) there's a depth and balance that's neither as thin or bright as our reference Strat. Volume down, tone down and on the neck pickup alone, we played for ages with just a clean valve tone. The lack of volume drop between the dual/single-coil modes is a little unnerving - in humbucking mode, there's added thickness primarily in the lows, almost like you've added a mastering plug-in and evened up the volume. The middle pickup has a little more crispness to the highs compared to either 408 pickups in single-coil mode, adding another subtle flavour. Both mixes are also 3D-like in character and sound sweet, not over bright or thin, and there's a little Tele-like honk to the bridge/middle mix. Crunchy gains sound tough and thick, and metal-style saturated tones are surprisingly big sounding, making for a dream studio or covers guitar - or one that simply suits any player who has a lot of different styles under their fingers. Tipping the £2,000 mark for a flat-top bolt-on electric may seem steep, but with many high-line non-Custom Shop Fenders priced similarly - albeit with lower street prices than PRS - we need to re-assess our perception of the high-spec guitar. Value aside, this is one superb bolt-on that provides versatile humbucking and single-coil sounds and ticks stylistic boxes from jazz right through to classic metal. 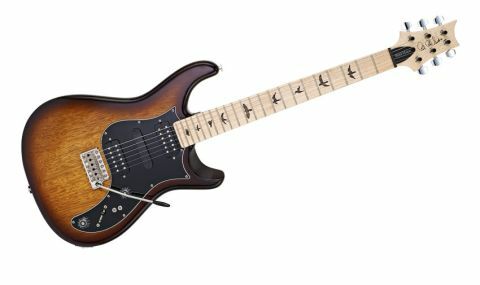 So long as those birds don't bother you, or the rather anaemic-looking maple headstock and neck, PRS may just have finally nailed the bolt-on. And some.